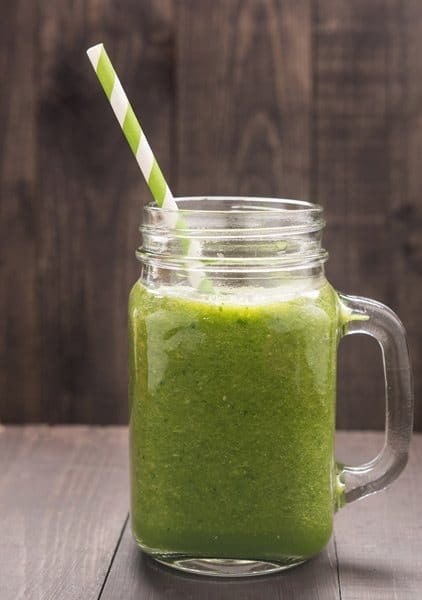 You might have discovered that making smoothies is a fantastic way to add more vitamins and nutrients to your day, but unfortunately you don’t have the time or patience to portion out a whole drink every morning. Having a large enough variety of vegetables and fruits, and keeping them fresh is also challenging. But who says that you have to put all the ingredients together when you want a smoothie? Who says that you can’t plan ahead and have everything ready to go beforehand? What is a Make Ahead Smoothie? 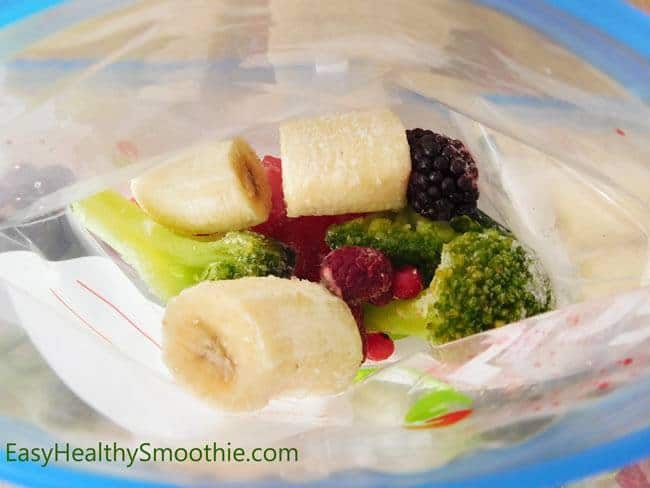 Imagine just tossing a bag of ingredients to your blender’s pitcher, hitting the “blend” button and there you have it - a chilled, healthy and delicious beverage. This is my favorite healthy kitchen hack - much more convenient than trying to do it all at once every morning. Then you freeze this bag, which keeps intact as many nutrients as possible, plus giving you a deliciously chilled result. Another advantage of blending frozen ingredients is you won’t need to use ice. When you add ice to smoothies, it dilutes the taste of the smoothie and makes it less creamier and possibly a bit bland. If you’re still new to the idea of making drinks out of fresh (or frozen) fruit and vegetables, then you might be wondering if it’s even worth all the extra work. After all, you have to peel, chop, and store all of your ingredients together. Do you love to cook? 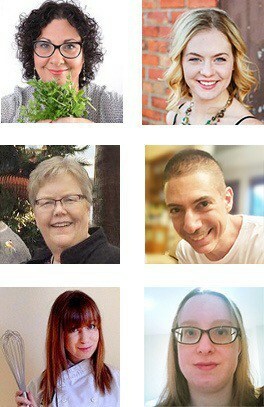 Are you ready, willing, and able to prepare fresh and healthy meals all the time? Even if you are, adding vegetables into your diet requires that you eat them by themselves, unless you’re making salads or fried plantains. A store-bought smoothie often contains only fruits, which means their high on fructose sugar and don’t contain vegetables. That means you can ensure that you’re getting all of your necessary vitamins, minerals, and other nutrients without having to choke down some questionable vegetables (looking at you, brussels sprouts). Do you see breakfast as a meal that you can do without? Even though it’s the most important meal of the day, many choose to neglect it entirely or opt for unhealthy choices like bacon or a bagel. Now, you may be thinking that all of this is a moot point because you can go down to the store and buy a smoothie without having to make it. However, if you add those up every day for a month, you will be spending far more money than you would if you got the ingredients and blended them yourself. Now that you’ve seen the benefits of making smoothies, we’re sure that you can’t wait to get started. However, before we can begin, we’ll need a few different materials so that we can jump right into the action. 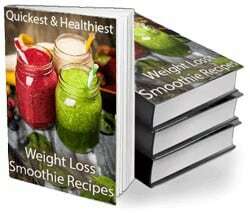 It should go without saying that having a blender is an absolute necessity when making smoothies. Without this vital piece of equipment, you’re just eating raw fruit and vegetables. If you don’t currently have a blender, then we have some excellent reviews of various models that you can buy. Some appliances ideal for smoothies only, whereas others are ideal for all kinds of kitchen activities. If you already have a blender, then you’re good to go. Hopefully, it will still be in good shape, but if you haven’t used it for a while, then you might want to make a couple of batches to see how well it handles. Just one important word of warning: your blender should be designed to handle frozen ingredients and ice! Using freezer bags is beneficial for a few reasons because you can mark them with the contents and you can reuse them without any problems. Best of all, they stack on top of each other, and once they’re frozen, you can prop them on their sides to make even more room. To keep yourself organized, you will have to mark your bags as you fill them. The data that should be on each batch is the ingredient list, portion sizes (so you can adjust the recipe as needed), and date of freezing. Use the bags in a FIFO way (First In, First Out). This ensures you don’t waste any food. For freezing a pre made smoothie you can simply use a freezer cup closed with a lid. When you want to drink it, take it out and leave to stand until thawed, or use a microwave if you’re in a hurry. So, we’ve got all of our supplies and our ingredients. Now, what’s the next step? Thankfully, creating smoothies ahead of time is so easy that anyone can do it. Just follow these steps and feel free to experiment and try new mixtures. This method is ideal if you want to prep your meals long in advance. Fruits will last about three or four months in the freezer, whereas veggies and greens will last about two to three months. Depending on what kind of fruit you’re using, the first move will be to take off any peel or rind that is part of it. Oranges, pineapples, kiwis, bananas, and pomegranates are some of the most common ingredients that have to be prepped before you can do anything else. 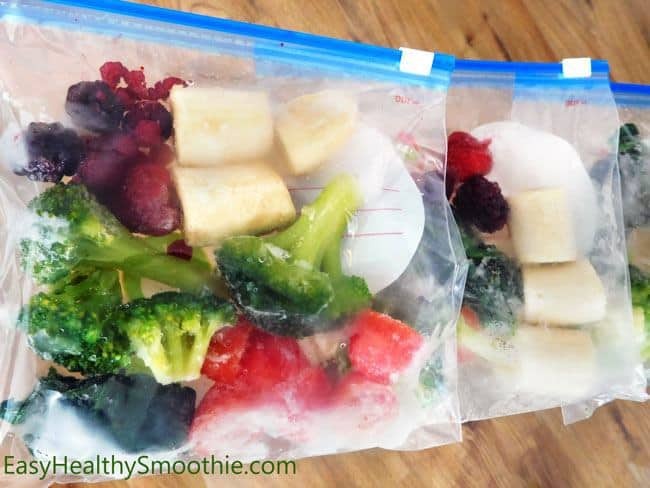 Once your fruit or vegetables have been chopped up, then it’s time to start bagging them. While the perfect ratio will depend on your personal preferences, a good rule to follow is that you have an equal amount of each kind of fruit. Once you’ve made all of your bags, then it’s time to mark them. As a refresher, here is a template of what it should look like when finished. The “need to add” section is for you to know what will work best with that particular mixture. For example, if you have a lot of juicy ingredients then it might be better to use juice as your base liquid. However, if you want it to be creamier or have more calcium, then it’s best to use milk and/or yogurt as a base. Questions I’m being asked a lot about pre-making are: can you freeze smoothies? How would you store smoothies? Will they taste the same as freshly prepared ones? If this is your preference, then you will want to invest in freezer ready mason jars or other containers that can freeze well. Obviously, using a plastic bag won’t work well, so don’t try to use them. Everything will be the same as before, except that you won’t be bagging up your fruit chunks. Even though you are blending them immediately, it’s always better to cut them into smaller pieces so that they will blend easier and more evenly. Mix everything together, including your liquid and any dry ingredients that you want to add. The reason that you want to do everything at once is that you won’t really have the option of adding new ingredients when it comes time to drink it. Once your mixture is made, then pour it into your containers and mark it. Again, it will be best if you include the entire recipe so that you can adjust it if necessary, but if you don’t have that much space for writing, just put the name of the smoothie and the freezing date. 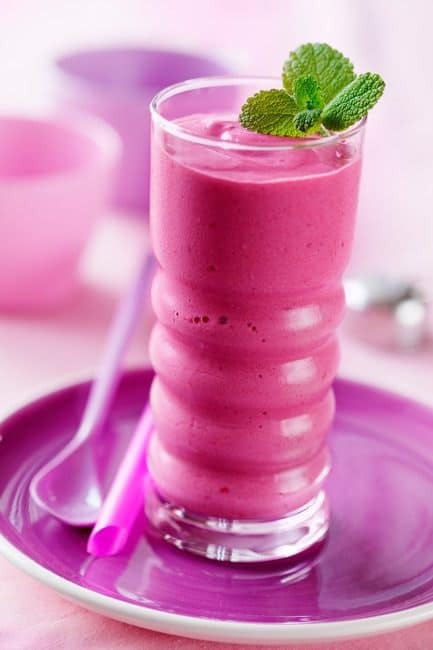 When it comes time to enjoy your premade smoothie, there are several ways you can do it. For this to work, you’ll need a blender capable of handling ice well. We have a guide on the different types of blenders and which is best for tough ingredient, but generally you’ll need one of the more powerful personal bullet blenders, or a high performance blender. In a rush to thaw the frozen ingredients? Toss them into the blender, then pour ½ glass of hot water from the kettle. Leave for 3 minutes and everything will likely be quite thawed. Finally, you can pull out the frozen smoothie in its container and then take it with you. That way, it works like an ice pack for your lunch, and it should be ready by lunchtime. Just be sure to include a straw so that you can drink it without any mess. 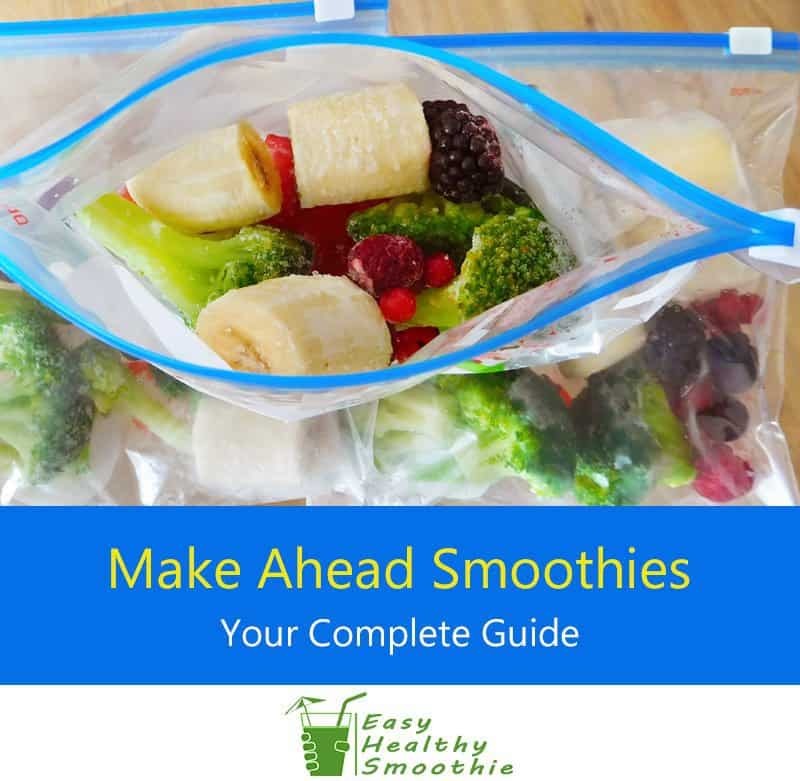 Have more tips and tricks from your experience with make ahead smoothie? Any questions? Feel free to leave a comment below. Want breakfast smoothies in 1 minute or less? If you’d like to eat healthier and easily get more vitamins and nutrients, then follow this quick guide to the most delicious and convenient “make-ahead” smoothies! Thanks for your message Angela. 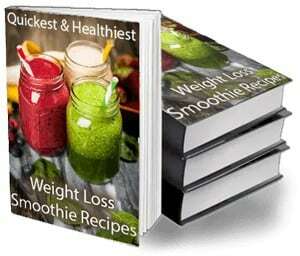 You can use any of the recipes in our free recipes eBook (link is at the beginning of this post). Any standard recipe can work. Happy smoothing!